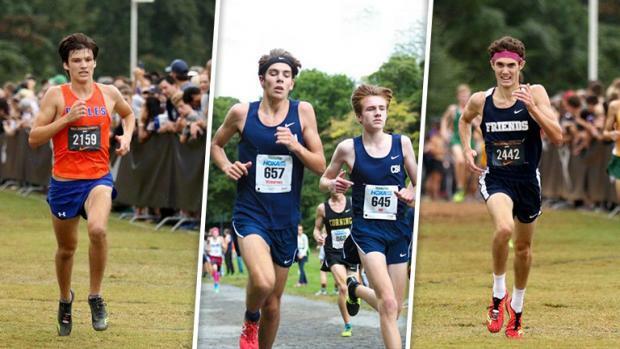 The 11th Boys Eastern States race at the Manhattan Invitational is set to kick off on Saturday with a stupendous amount of talent. From the NYC region, four of NY's top five teams and six of NJ's top ten squads will be awaiting the arrival of the top teams from RI, FL, and DE plus a powerhouse CA team that is among top 10 in the nation. And when you get eight of the top 20 teams in the nation together in one race not called NXN, you know something very big is going to happen. CBA-Lincroft is looking for its seventh Eastern States title after winning the last two times, and it has a deep and explosive squad. 2014 winner Fayetteville-Manlius lost by 13 points last year but has a well-rested squad that is rated among the top 4 teams in the nation. Other top US rated teams include Claremont from CA, La Salle and Bishop Hendricken from RI, Smithtown from NY, and Haddonfield from NJ. Another team that will be moving into the top ratings this week is a Bolles team from FL that finshed 7th in the ES last year and 2nd last weekend at Great American. A pack of other very strong teams including 2015 ES winner Downingtown West, Corning, Westfield and Liverpool should help to make this race a Manhattan classic. VCP will be rocking, elite runners will be rolling, and around 2:30 on Saturday, all things will be revealed. ♦ 7 (or 8) top-20 ranked teams in The US, and four teams from last year's NXN Nationals. ♦ 5 teams that are top ranked in their state (DE, FL, NY, NJ, RI), plus 9 more that are ranked in their state's top 5. ♦ At least five of the nation's top 25 speed-rated guys. Get out fast and furious. If you're stuck in the masses in the middle when you hit the cow path, you might as well take a left up Cemetery Hill and rest in peace. Plunge the downhills. The many short steep ascents in the roller-coaster back hills take it out of you, so make the descents give you something back and push you part way up the next slope. Don't fire until you see the green of the finish line banner. Too many runners start blasting their engines when they get down to the parade grounds with still 700 meters to go and end up crawling home. Be a smart tortoise on roller skates for the first 500 meters before turning into a crazy hare for the last straightaway. The weather looks to be cool and dry, so the times should be very fast. Can't be beat.